BMW has been awarded the CarIT-Award 2016 for its remote control parking system, which celebrated its world premiere in the new BMW 7 Series recently. The awards celebrate technologies which saw their debut in the year prior to the ceremony and are sponsored by German specialist magazine “CarIT”. 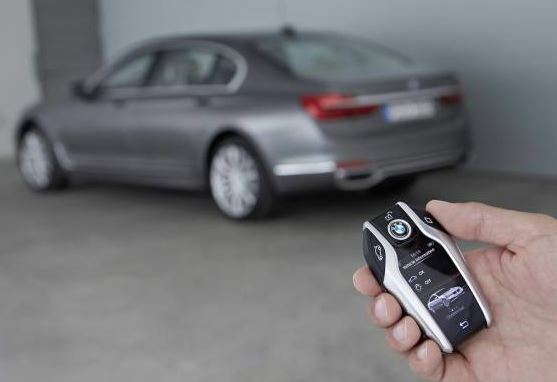 The remote control parking option allows the car to be driven into and reversed out of garages or perpendicular parking spaces, without a driver at the wheel, and is activated by the driver using the likewise newly developed BMW display key. The systems execute a semi-automated process while the driver stands outside, watching out for obstacles. The whole parking procedure is monitored by the park distance control (PDC) system, the parking assistant and the surround view sensors. To activate remote control parking, the car just has to be positioned centrally and squarely in front of the selected parking space or garage. The BMW 7 Series driver can interrupt the progress of the car into or out of the space in a controlled manner at any time. German magazine “CarIT” teams up annually with Prof. Stefan Bratzel from the Center of Automotive Management in Bergisch Gladbach to carry out its “Connected Car Innovation” study, and has done so since 2010. The most innovative car makers and countries in the “Connected Car” field of technology are then ranked by a jury of experts. The CarIT Award 2016 for the Remote Control Parking system from BMW was presented at the CarIT-Congress 2016 during the IAA Commercial Vehicles show in Hanover.